Today was busy and fun-filled. Gideon slept through the night again, and woke up well rested. Daniel was off, so he accompanied us to Mommy Bible Study and watched the kiddos while us moms got to get some quality time. I came home, scarfed down some leftovers, and went to work for a few hours. I came back home, made a quick dinner for us, we ate, and then were out the door again for life groups. Gideon was completely exhausted by the time we got home and went straight to sleep. The best part of my week is the Mommy Bible Study that I go to. Our minister’s wife hosts it every Thursday morning, and it has become a lifeline to all of us. It is the thing I look forward to most in my week. All the kids get excited when Daniel is there. He sings songs with them and reads them lots of books. Lanita got a picture of of Daniel and the kids in the basement today. Bernsteins Bears was the book of choice this morning. I cannot get over how blessed I am to be married to him! Another day in January, another day of snowfall. It has been snowing on and off for a week, and then it stopped day before yesterday. The snow was beginning to settle, and I could see all the paw prints of animals all over the backyard and front yard. I thought the snow was over, so I made big plans to get out with Gideon and make it an errand day today. My initial hustle and bustle when I got out of bed came to a screeching halt when I opened my bedroom window this morning. Sure enough, a few more inches had covered my street and my driveway. I love seeing the snow. And this morning especially was enchanting. It was still dark, windy and blizzard-like. But all the same, I let a sigh of disappointment escape me. I was really looking forward to getting out of indoor clothes and out the door for some fresh air. I haven’t let it lick me yet, but I can see for sure why people say they get in this depressed funk over the winter. If one is not careful, one can really let cabin fever, lack of sunshine and fresh air ruin the winter season. If Gideon weren’t here, and I were cooped up in this house without going to work or nothing to do, I can guarantee you I would not have the positive outlook that I have right now. Gideon has been such a good sport through this freezing weather. At times he is more clingy than others, but even when he wants to be close to me I have no problem dropping what I’m doing and playing with him on the floor for a little while. I’d rather play with him than do whatever chore I’m doing! If he’s especially fussy I’ll just wear him, and we both win. For the most part, though, Gideon is really into exploring this little world of our first floor. He loves to sit by the dining room windows and watch the traffic. It’s the most adorable thing ever. I haven’t gotten any pictures of it, because as soon as he hears the camera it would shatter that beautiful little vision I’m trying to admire. All in all, today was a good day. It’s Daniel’s birthday week, and we are plain out of food. So I officiated today as a cheat day and ordered pizza. We enjoyed our slices of pizza while watching an episode of “Shark Tank”. That was seriously the highlight of my day. I’m feeling it now, but it was totally worth it. My day is now come to an end, and I think I’m going to make it a girly night for myself. I’m going to enjoy a nice warm shower, and maybe even give myself a little selfie-pedi before going to bed. This is what happens when I take a quick bathroom break. We are going on day 3 of snow. Tonight we are supposed to get a few more inches. I love snow, I love cold. Having Gideon changes things, though. While I used to get on with my life when it snowed, bundling up a 10 month old and preparing for even the simplest of errands is sometimes just not worth it to me. So I try to make the most of our time at home, and remind myself that spring will be here before we know it. We can make up for lost time in the great outdoors when the weather gets better. We had invited Daniel’s parents over for dinner last night, but I got called in to work so we cancelled. Instead, we had a delicious lunch together and spent time visiting before the snowfall began at 3:30 PM. I made some beef butternut squash chili, and it was a hit with everyone. I made some for Gideon as well without a lot of the spices or tomatoes, and he devoured it. After we put Gideon down for his afternoon nap, we sat down for a good game of Scrabble. 3/4 of the way through the game, we got sidetracked and began talking about some of our home improvement and remodeling projects that we want to accomplish someday. Daniel’s parents recently re-did their kitchen, and it was great to get good ideas and insight as to what you can expect when such a big project is taken on. It got us both excited for sprucing up our home in small ways while we dream about those mammoth ventures of ours. 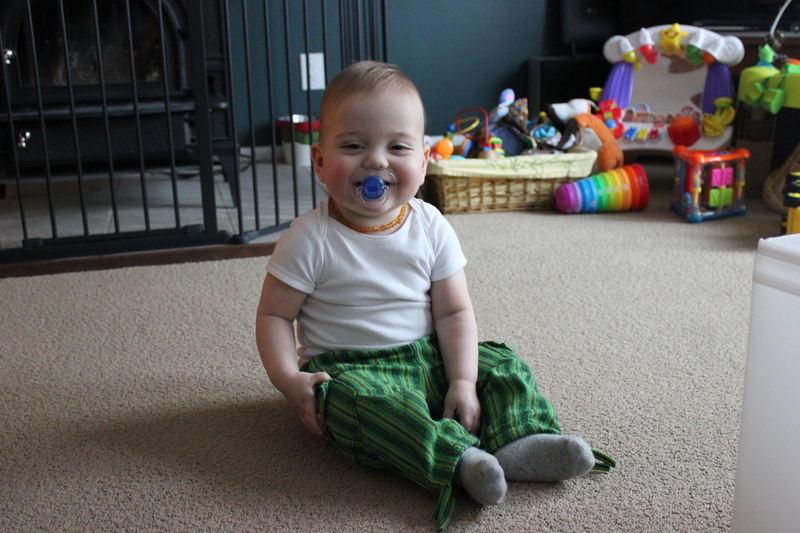 Here are some pictures of our day and a clip of Gideon being cute. Gideon loved his leftovers with avocados and apples. 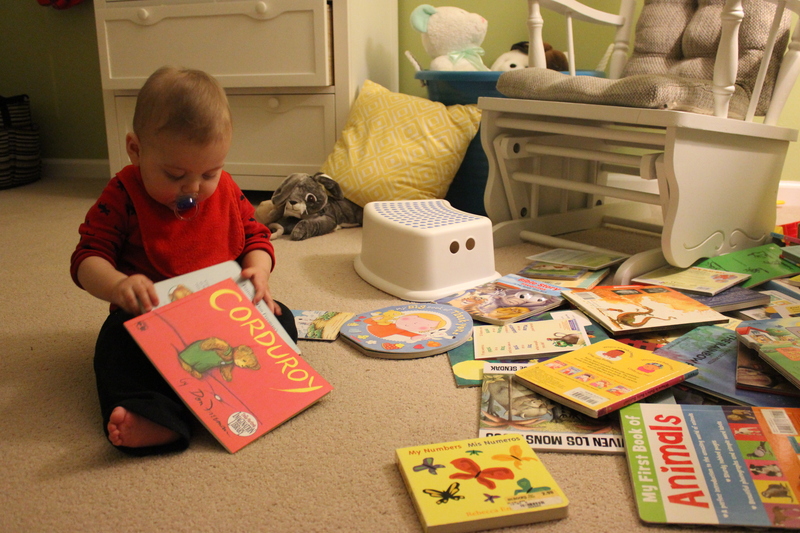 Before bedtime we spend a little while in his room reading books. Gideon has a hard time picking one, so he just pulls them all out of the shelf and throws them on the floor. If it were up to Gideon, everything would be made out of books. Daniel built a shelf for me in the laundry room, and I’m so excited to decorate and put some finishing touches on the room to make it less of a utility room, and more of an extension of our home. I’m ready to make the space – not only functional – but pleasing to the eye. – a space that makes me happy to be in, even when it’s to do not-fun things such as laundry! – systematic. I needs things to go smoothly. – did I saw functionality and practicality? There. Step 1 complete. Tomorrow I’m going to begin step 2: purging excess and planning how I’m going to get my needs met. Project Simplify 365: In an effort to rid ourselves of all our plastic food storage containers, I bought three glass containers from the Dollar Tree. True treasures if I may say so. Just like my Pyrex containers, only much cheaper! I got rid of 4 plastic containers, two of which were missing lids, and the other two (stained and all scratched up) Daniel will recycle and use in his wood workshop. Gideon has begun sleeping through the night and we love it. He’s had a few nights where he needs a red eye diaper change, but 8 PM to 6 or 7 AM the next morning is the new norm. I actually don’t mind that he wakes up a little earlier than he used to. Gideon continues to take a nap 2 hours after he wakes up, and an earlier morning nap means he’s more rested for church on Sunday mornings and the Mommy Bible Study we go to on Thursday mornings. It also allows Gideon to see Daniel in the mornings for a little while, which is a boost to everyone’s moral. What with Gideon having been sick and then developing a stubborn night-time cough, it’s thrown a little wrench in the routine we had established last year. We grew to accept it and went with the flow. Like I’ve elaborated on before, we are ok with the fact that there are times when routines can be maintained, and other times require flexibility. For the past few weeks, going with the flow has been really helpful for us. Now that Gideon is feeling better and sleeping through the night pretty consistently, I think I’m ready to get us back into a day routine. When we all are in good health, we seem to really thrive and enjoy our day more when there is somewhat of a pattern to follow and anticipate. I’m looking forward to seeing what our new day-to-day looks like. Today Gideon’s day started at 6:30 AM. It was a cold morning, and cold mornings always call for a lot of snuggling and giggling and singing songs. Daniel got a little bit of quality time with Gideon, and then it was time for breakfast. We had some yummy almond butter pancakes for breakfast. I chose to bake them since the pancake flipper Daniel was not around. I drizzled a tiny bit of maple syrup on them and served them with some banana, and it was a huge hit with the little guy. Who doesn’t like a sweet treat? Pancakes were a hit with the little man. While Gideon took his morning nap, I got things picked up and got ready to hit the grocery store as soon as he woke up. I really was not looking forward to getting Gideon out in the cold, but I had no choice. Snow was threatening, so as soon as Gideon woke up we were out the door. I strapped Gideon in the Ergo, and we shopped. He loves being face to face with me, and learning the names of all the vegetables and fruit in the produce section. There was a sweet old man with a thick accent who was asking me about my reusable produce bags. When he talked to my little sidekick, Gideon got shy, smiled, and nuzzled up against my chest. It was so sweet. Sweet little memories I want to tuck away. I tried to rush through the store (ended up forgetting a few key items) to avoid getting stuck in snow. But the snow caught up with us, and it was falling pretty hard when we exited the store. Having Gideon in the Ergo kept him cozy, though, since I threw his big thick blanket over him, and I don’t think he ever felt the cold. He fell asleep on the way home, transitioned from the carseat, and I ended up collapsing on the couch with my sleeping baby boy. It was cold enough outside to keep my groceries fresh in the car. He woke up about 15 minutes later in a great mood, and played while I got lunch ready. Gideon absolutely loves stuffed animals. He’ll burry his head in them, and snuggle with them. Mr. Fox is not exception. I made my first batch of arrowroot cookies for Gideon yesterday, and Daniel and I liked them so much, they’ll be a new staple in our kitchen. Here is a clip from one of the fun moments we had today. Who says laundry should be folded? Gideon strongly believes it’s overrated. Soundtrack: A 90’s playlist that I am just loving. Spice Girls, Sugar Ray, Aaliyah, old Matchbox 20 stuff … it’s music that will always hold a special place in my heart. I’ve been listening to it a lot after Gideon’s in bed and it’s time to clean up. Makes cleanup go by much faster. Project Simplify 365: Went through the pens in the kitchen desk and tossed all the ones that don’t work. 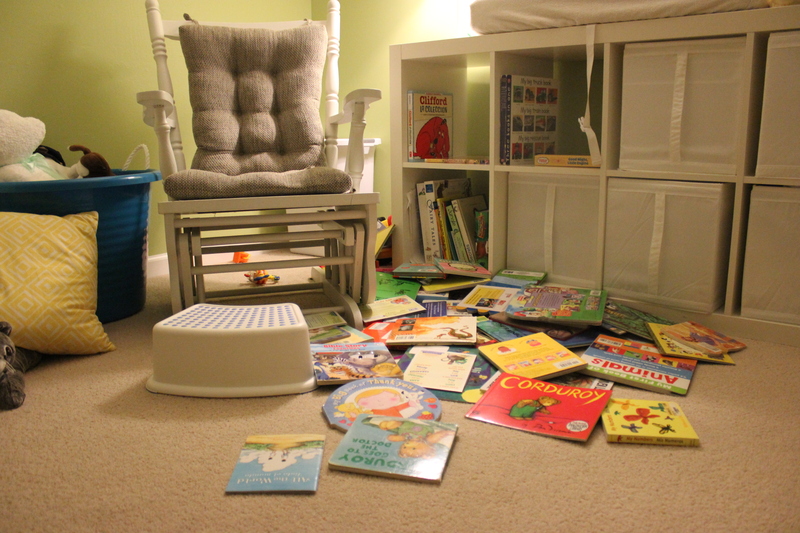 Gideon is on the loose, and we need to step up the baby proofing. Kitchen cabinet doors are a new favorite of his, and unfortunately what is behind most of them is not appropriate for a 10 month old. Gideon is not even a year old, and he’s already an adrenaline junky. He loves to “fly” and wrestle with his dad. He’s also shown us that he has no fear of what could potentially happen if he just let himself dive down the stairs. Daniel installed a gate at the top of the stairs because we know better than to think he’d get a fun rush by falling down them. Early this morning, I had a lapse in judgement. We keep a gate that we move around the house as needed, and this morning I set it up in the doorway of Gideon’s bathroom because had some diapers to spray. By the time I had turned my back to Gideon, clicked the gate in place and turned back around, I saw Gideon fall head first down the stairs. He slid tummy down for a few steps, and then rolled on his side down the next 3. Thank God, we have a landing. I don’t even remember what I said or did, but somehow I was at the landing and cupping Gideon’s face in my hands, apologizing profusely, and seeing if he was ok. Daniel, who had been asleep, was next to me in a nano-second. Gideon was scared and crying. I scooped him up in my arms gently and hugged him. It wasn’t two seconds later Gideon started kicking and smiling when he saw Daniel. I was so relieved to see that he was ok, and more afraid than anything else. After checking his body, all I saw was a little red mark by his left eye where it looks like he bumped himself. Other than that, he seemed to be just fine. I had a hard time keeping it together, and Daniel was extremely nice to comfort me. I know that Gideon will get injured along the way as he explores the world around him. I’ve already caught him eating cat food, and I am slowly learning to ease up on my need for disinfected and clean surfaces. But knowing he is going to get hurt doesn’t make me dread his future injuries and pain any less. It only took one second of me not looking, for Gideon to have a fall that could have caused some severe damage. That’s scary! I’m so grateful that he is ok.
Small babies and children are just so fragile. The idea that God entrusted me with the life of this precious little boy is still daunting to me. But I have to be careful about how I allow myself to react to things like what happened this morning. If I’m not careful, I can slam myself down so badly that I lose focus of the responsibilities God has given me. In the past, I may have beat myself up and felt so unsuited to be a mother. Now I see how that is not really a healthy or productive reaction. Instead, I want to focus on making better choices in the future and be thankful that – while I am undeserving of such a wonderful little family – God sees who I am, the good and the bad, and still has faith I can do this thing of being a good wife, and a good mother to this hilarious little boy. Project Simplify 365 : There is a leaky sippy cup that keeps taking up space in the kitchen cabinet. As of today, it’s gone bye bye. My baby is 10 months old. Where did the last 10 months go? I have always heard mothers go on and on about how time has flown, and their babies are growing so fast. I never took it too terribly seriously. I just figured it was one of those things moms say. Time has flown! My baby is growing so fast! There. I said it. And I meant it! I’ve caught myself brainstorming ideas for Gideon’s first birthday party, and could not believe myself. Part of me feels like he just was born, and loves cradling him like a newborn. Another part of me feels like Gideon has always been in my life. I always wonder how I ever got along without him. Other than work, I’m not really sure what I did with my time. I love every part of my day with him. Diaper changes are never just diaper changes. Most of the time they turn into play time. I let Gideon play in just a diaper, and I watch and admire him. I am obsessed with Gideon’s little body. I love his face, pouchy belly, chubby hands, and his adorable legs. On a whole other level, I am obsessed with his feet. For me, the saddest part of this winter season has been having to put socks on Gideon’s feet. I can’t see his little toes! I am enjoying him more than I ever have, and I think it’s just going to get better. I can’t wait for him to walk, and start using words to communicate. He’s simply a great eater. He loves meat. Chicken, ground beef, ground turkey, the works. 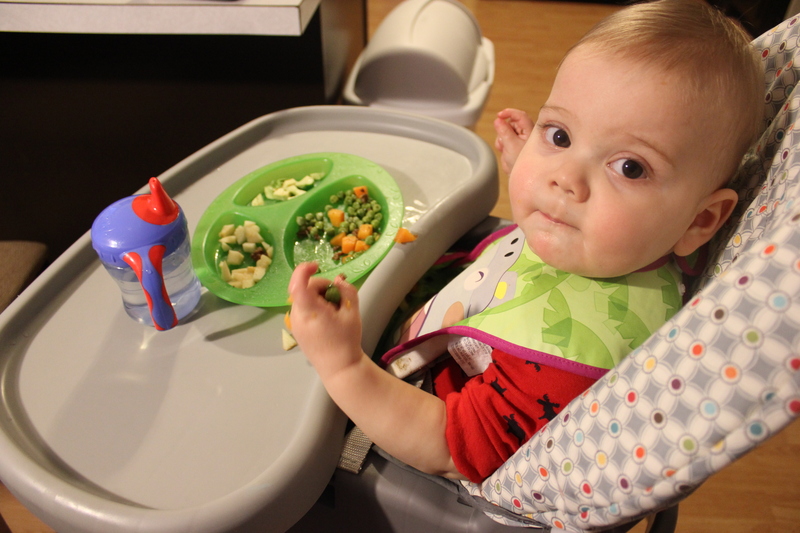 Gideon’s pediatrician told us at his 9 month checkup that she recommended we wean him from his night time feeding. He gets enough calories in the day to last him through the night. I’m having trouble deciding whether I’ll follow her recommendation or not. If it’s a matter of convenience, than sure. I would rather not make a bottle at 1 or 3 in the morning. But I don’t think this is a convenience issue. I think it comforts him to have a bottle when and if he wakes up at night. I imagine if he were breastfed, I would allow it. I would let him wean himself when he was good and ready. I might not offer to nurse, but if he requested it, I would do it. Is the bottle any different? I need to discuss it with Daniel a little more and get his input. He is learning how to play with cars appropriately. He has a big dump truck and tractor that he pushes around. He started pushing a fire truck around the church play room yesterday all on his own! Gideon is still at the phase where he throws everything. Everything. Testing gravity perhaps? He is getting more comfortable being held by people who are not Daniel or I. Gideon is very familiar with Daniel’s parents by now, and is warming up to our friends and church family. I think he is a great judge of character, and is learning who loves him. We have realized that it is lesson-learning time. Gideon is mobile now, and experimenting where his limits are. Re-direction and avoiding temptation is the best way to keep him from doing certain things. Gideon loves being chased. He goes nuts when we crawl after him. When Gideon got sick, he regressed a little in his ability to put himself to sleep. As soon as his nasal congestion and discomfort was gone, we re-introduced his sleep training, and he’s done great with it. Gideon is taking 2 naps a day consistently. He takes one morning nap two hours after he wakes up, and then another in the mid-afternoon. This week, each nap has been anywhere from 1-2 hours long. I love this schedule, because it gives me the necessary breaks in my day to relax or get something done. He wants to be involved in every thing we do, and it’s something we really encourage. We want him to be excited about learning and observing what we do. Which means we need to start to being cautious about what we model for him. Caution with the wood burning stove is a great example. Gideon loves to “help” Daniel build a fire, but Daniel is great about showing him and telling him to be safe. Gracias abuelos por los pantalones! Son muy cómodos! For the longest time we thought Gideon was predominantly right-handed. 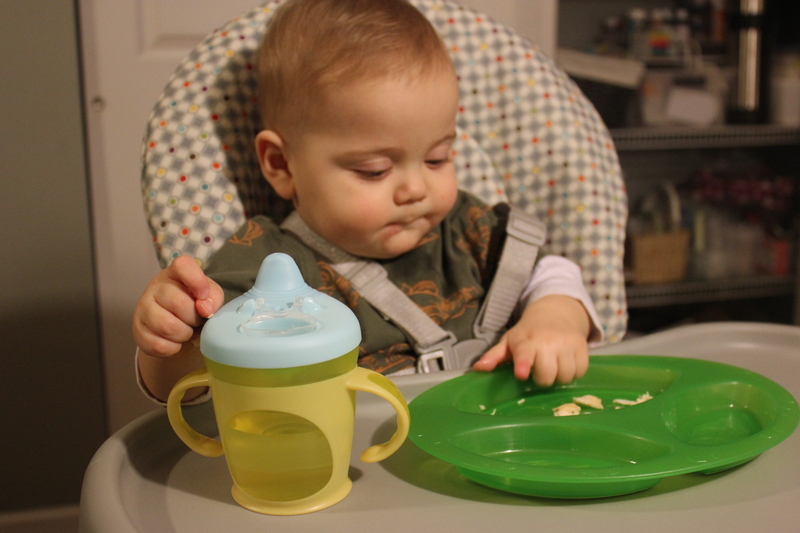 He mostly self-feeds with his left hand, though, so we’ll see what comes of it. He’s crawling. Fast. He can crawl on all fours, but prefers to do a sit-crawl. I’ll try to get some video of it soon. It’s adorable. He pulls himself up and can stand really well. He can sit down from the standing position without flopping down. Very controlled and methodical. He’s so smart! He can walk with an assistive device. The other day he was pushing a plastic tub around the living room, and didn’t even realize he was walking! I’m so grateful that Gideon like to cuddle. He wraps his arms around our shoulders, and even lays his head down sometimes. When he sees Daniel after work, he is so loving and touches Daniel’s face and talks to him. I love it when I’m standing in the kitchen and I feel his little hands on my legs, to pull up. Gideon is really learning about tone of voice and loudness as ways to communicate things. He will sit and play, all the while babbling to himself and playing with the intonation of his voice. He can produce all of the frontal consonants (plosives, bilabials, lingua-dentals, and alveolars), and he’s starting to put them together in different CVCV combinations. It will be interesting to see, what with learning baby sign and being a boy, whether he’ll be an early talker or not. Either way, I think baby sign is going to be a great tool for him until he has the desire to communicate with words. We are working hard on the sign for diaper, cat, eat, and drink. He watches us intently when we do it, and I have a feeling one of these days he is just going to explode with a bunch of new signs. I’m sure there are things I’m leaving out, but I was really slacking on getting his 10 month update written. What was your little one doing at 10 months? Gideon gave me a run for my money last night. He was coughing so much that it finally woke him up at around 10:30, and he didn’t fall asleep again until 11:30. He only woke up one more time at 1:30 for the usual diaper change and a bottle, but that extra hour of struggling to figure out what the little guy wanted really wore me out. Plus, I had really odd dreams all night that kept waking me up. Plus, Gideon woke up an hour and a half early which really wore me out. I turned on a short video for Gideon to watch, and I caught some more shut eye. Caught red handed! Gideon is becoming obsessive about the dishwasher. He hears me open it, and he comes crawling/racing to help me unload it. His favorite thing is pulling silverware out and dropping them on the floor. I have learned to just sit by Gideon and let him “help me” and catch falling silverware before I put it away in the drawer. He sees me take everything out, and wants to do the same. I’m not about to discourage a helper in the making. I’ll welcome the help emptying the dishwasher one of these days! Today at lunch, after downing a whole banana, Gideon started whining like he does when he’s had enough of sitting and eating. I asked him “are you all done?”, and for the first time he waved his little right hand saying “Yes, I’m all done.” Usually when I ask Gideon if he’s done he’ll smile and say “ah-dah”,and then sign “more” because that’s what he knows to say when he wants something, and at the end of the meal he wants to be all done. I gave him lots of praise and kisses, and he carried over the skill to dinner. I’m so proud! I took Gideon in for his 9 month checkup today, and got the hoped-for clean bill of health. Despite the fact that he is just now getting over a cold. I was so afraid to hear things like “fluid in the ears” or “congestion in the lungs”. Phew! Gideon is officially exactly half as tall as I am. I am 5′ even, and my 9 month old son is 2.5 feet tall. My little giant is in the 93% for height. Little Giant indeed. For the first time he had to get blood drawn for anemia and to test for led. He was not happy, and neither was I. I’m so glad he doesn’t have to get pricked again for another 3 months at least. Tonight we hosted our first life group for the year, and it went really well. I’m stoked for our new weeknight time, and our group is pretty great. The group of people at our house tonight had already been in small groups with us before, so we were able to skip all the first-time formalities and jump right into some good discussion and personal prayer requests. I’m looking forward to “taking back our sabbath” like Daniel’s parents say. I look forward to having a day of reflection, rejuvenation, rest, and lots of impromptu lunches with family and friends we don’t get to see outside of Sunday mornings. Having a day to relax and regroup will be beneficial, especially for Daniel who works really hard to provide for our little family. My evening goal tonight was to take down all Christmas decor and store it in its assigned bin, but why do today what I can do tomorrow? Truth be told, I’m just putting it off because I don’t want to give up the cozy effect the Christmas tree has on our living space. Project Simplify 365: Daniel’s cousin gave us an adorable tote from Thirty-One that I plan to keep in the car with the rest of our reusable bags. In effort to replace and purge at the same time, I got rid of 2 reusable bags (an old promotional “Morning Glory” bag I got for free in Cleveland a few years ago and an ugly black bag that says “Bearcats” on it), and replaced it with one cute bag.